Using an electric mixer, beat butter and 1/2 cup powdered sugar in a large bowl until light and creamy; add vanilla and almond extract and mix well. In bowl of food processor, pulse flour, pecans and salt until nuts are finely chopped, about one minute. Add flour mixture to butter mixture; stir to blend. Refrigerate dough until firm, at least 2 hours or overnight. Preheat oven to 325°F. Prepare baking sheets by lightly greasing with butter or spraying with non-stick vegetable spray. Drop cookie dough in rounded teaspoons one inch apart onto prepared pans. Bake until light golden brown, 15-20 minutes. Cool completely. 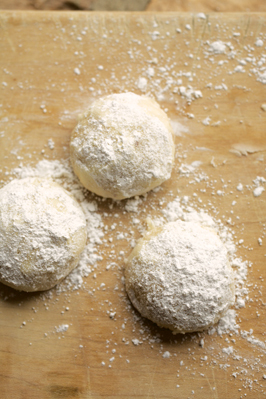 Place remaining powdered sugar in shallow pan or plate; roll each cookie in powdered sugar until coated.